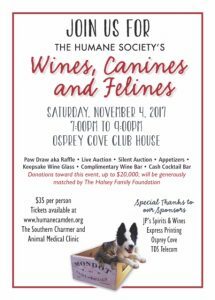 Join us at Osprey Cove Club House on Saturday, November 4, 2017 from 7:00pm-9:00pm. Tickets – $35.00 each Also available for purchase at two area establishments, The Southern Charmer in Kingsland and Animal Medical Clinic in St. Marys. If you are unable to attend, but would still like to make a donation, please follow the link to our donation page, and give whatever you can! Please write WCF in the special instructions area.